I'm always looking for ways to be sure students know what they're doing online before they get there and to be sure their parents are comfortable with what they see their children doing. I believe this post showcases a best practice for that very thing. As always though, I look to you for feedback and more suggestions. Karen McMillan (@mcteach on Twitter) just gave an awesome presentation on Classroom 2.0 Live where she showcased her Paper Blog activity. You MUST watch the archived session here. Karen shared her Paper Blog activity with me a few months ago and I've used it with my students to get them ready to blog with the "real thing." My students have practiced writing and most of all commenting appropriately. This week, my students will be receiving their real blog credentials and I'll be showing them the technical aspects of posting to their KidBlogs. Based on a recent comment to my class blog by an Australian teacher, I found my way over to his blog and loved what I saw; a well organized blog with some wonderfully helpful support pages for his students. Realizing I've taught these skills to my students, but have no place online for them to go for reference, I just had to steal this idea from Mr. Campbell in Australia. I've made some modifications and I'm excited to share it with you and show it to my students who will hopefully use it as a reference. Please check it out here and let me know what your thoughts are. Have I left anything out? Lee, I love this post of yours! I need to teach my Grade 1 and Grade 2 students how to start commenting soon, and I usually share these same ideas with them, but I don't have a resource that they can easily access to remind them about what to do. I will definitely be sharing your resource with them as I model how to be a good "commenter." I hope that this will help my students write even better comments. Thanks for always sharing such wonderful ideas! 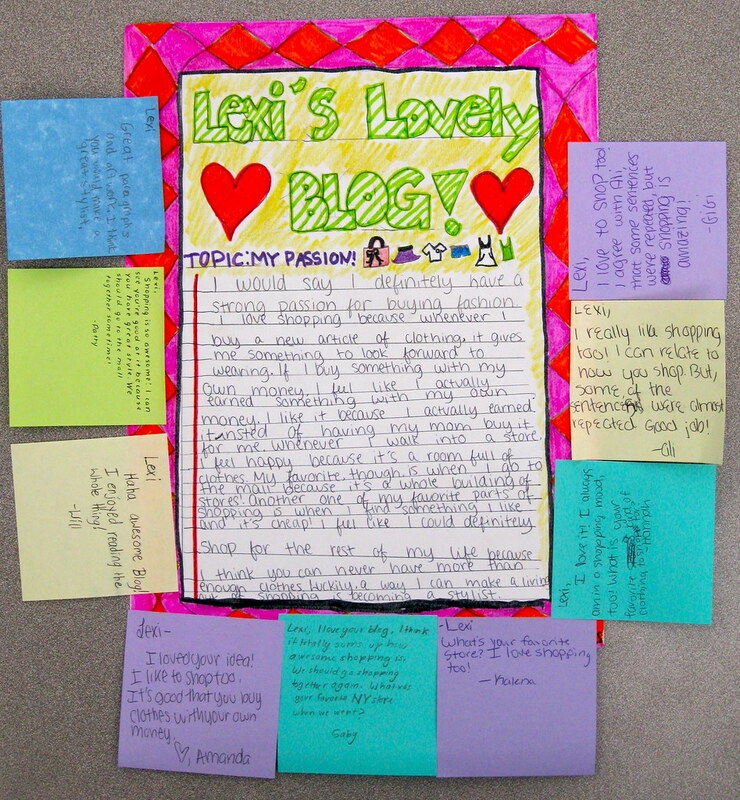 Thank you so much for sharing your insight into student blogging. Karen's paper blog idea will be the way I help teachers and students get started as well. I agree that we can't take blogging and creating a digital footprint lightly. That is just brilliant. What a simple way to teach and show online responsibility. Thank you! Lee, thank you so much for mentioning me in this post! You are far too kind. I hope you know how much I appreciate the fact that you were there yesterday to show your support. Always nice to see a friendly "face" in the audience! I love the idea of adding commenting reminders to my school blog. Great way to keep my silly seventh graders from using the "Oh, I forgot!" excuse! Thank you for everything, my friend! I think this is fantastic, and I'm glad to see other people are doing this. I've never referred to it as paper blogging, but that is exactly what it is. I think it is Tony Stead who calls it a 'write around'. Either way, for anyone else curious about trying blogging I also highly recommend this. Thanks for sharing, and I love your blog. I really like this idea because it’s a very simple way to teach students the rules of commenting appropriately on blogs. The layout is easy and simple to look at and it’s very informational. Great post! That was great! I really never thought teaching them HOW to comment before, just that they should. After reading this it made think that Wall Wisher would be good to use for practicing good comments! Thanks again! You should also check out the #classblogs hashtag on Twitter where lots of teachers are posting links to their students' blogs. This will give you a much wider cross-section of what different classes are doing with their blogging, both at primary and secondary levels (or elementary, middle and high to you!). I get the most positive response from teachers in other countries when I comment on class blogs, because their students suddenly realise they are getting visitors from around the world, not just their own locality.